Structural walls in the middle of a Housing Board flat may soon be a thing of the past, allowing home owners to make the most of the space they have. At Woodleigh Glen, a Build-To- Order (BTO) project in Bidadari ready in 2021, all 1,000 units will have their structural beams and columns tucked to the edges, so that residents can reconfigure the internal space according to their needs. The HDB will erect walls, but residents can hack these down at their own cost. Currently, most BTO flats have walls that are part of a structural wall, making it difficult to have a larger, open space. For example, newlyweds can start off with a flat layout that gives them a larger bedroom or living room. As their family grows, they can erect a wall to form a nursery. Such flexi layouts were first seen in Skyville@Dawson, whose residents began collecting their keys two years ago. But they could soon be standard fare, with the HDB pledging to apply "urban design solutions that are found to be technically feasible, cost-effective and well accepted by residents" to other housing precincts, HDB said in a statement yesterday. 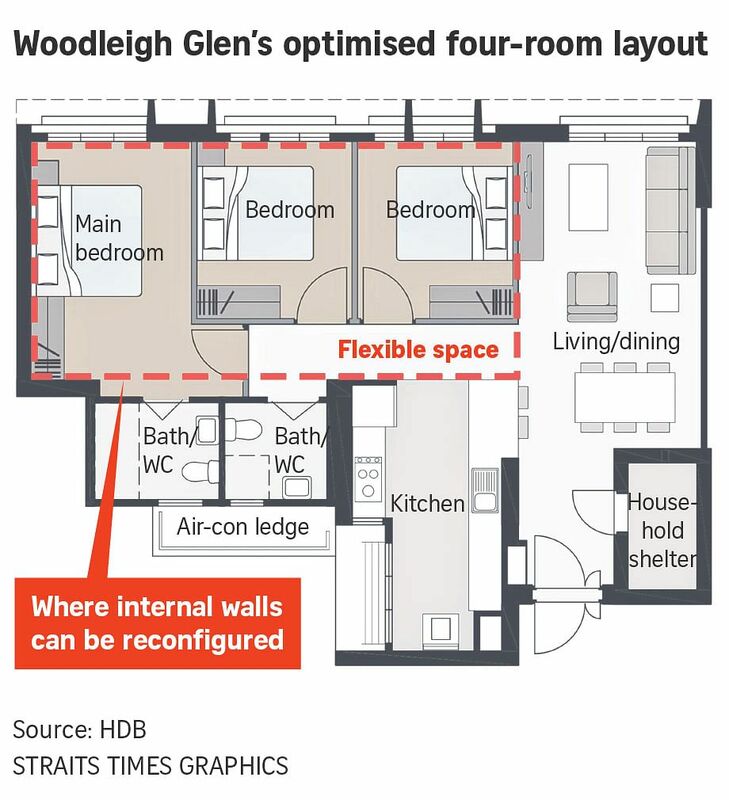 The feature is one of many that helped Woodleigh Glen clinch the Innovative Design Award in the "to-build" category of the HDB's annual HDB Design Awards. Another feature - screens that prevent rain from splashing into or flooding common corridors without compromising on wind flow or blocking out light. The project was planned and designed entirely by HDB's in-house team of planners, architects and engineers in the Building and Research Institute. Typically, the HDB ties up with developers and architects to design new homes. Housewife Estee Chan, 44, said the flexi layout was what drew her to her four-room Skyville@Dawson unit in the first place. "Although we did not change any of the original wall placements, I did not regret our choice after seeing some of my friends' homes with unsightly corners and niches," she said. Newlyweds can start off with a flat layout that gives them a larger bedroom or living room. As their family grows, they can erect a wall to form a nursery. Architect Calvin Chua of design firm Spatial Anatomy said the new configuration will allow home owners to be more experimental with their living spaces. "Home owners can work with interior designers even before they receive their keys or choose their flats," he said, adding that moving forward, the HDB could provide three-dimensional models of flats to allow owners to "work out the spaces on their own".